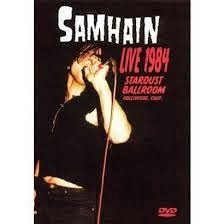 After the Misfits and before his solo career took off, Glenn Danzig fronted Samhain. With the smooth blend of horror, punk and metal this is by far his most criminally underrated musical endeavor. Filmed by Al Flipside, the image and audio quality are poor, but that is necessary in making you feel as though you were there. Apparently that's the way Danzig wanted this dvd represented. Filmed in the now non-existent Stardust Ballroom, the band is complete energy and you can tell by the ruckus crowd. Danzig is right down there with them, fist pumping in the air, and sweat pouring and flying from every pore as he belts out classics like: Samhain, Black Dream, Archangel, and I Am Misery. The band also throws in some Misfit tunes such as: Die, Die, My Darling, Halloween II, and Horror Biz. If you're a fan of anything Danzig has done due yourself a favor and seek this one out. It's got all the grit, horror and sonic violence you desire. You also get yourself a neat little sticker. I've had my copy since its release in 2005 and watch it frequently. The running time is 48 mins. So if you do hate it, it's only less than an hour of your life.